It's well made, sounds fine both acoustically and amplified, and comes in at a decent price - that's all we could ask for. Tones have plenty of body and warm midrange. Fishman IsysT preamp sounds great. Fiddly re-stringing process. Fingerboard is a little dry. 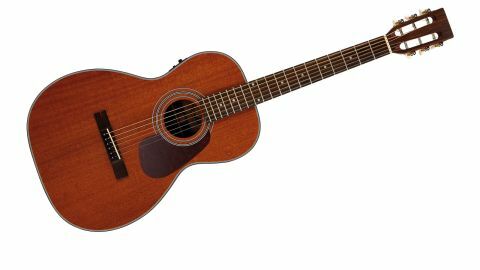 While you may be forgiven for assuming that the Farida M-15E is a travel acoustic due to its smaller body size, it is in fact what's known as a parlour guitar. Instruments following the parlour style have a body shape all their own, including a slightly pinched waist and a body that joins the neck at the 12th fret. "Played acoustically, the M-15E has plenty of body, with a pleasantly warm midrange and similarly toasty high end"
As it features a satin finish, playing the M-15E is a tactile experience that's aided by the bijou dimensions, which allow you to hold it close. The reduced scale length leaves room for 19 frets, and the old-school vibe is enhanced by a slotted headstock. Yes, this can make string changes something of a chore, but its traditional squared-off design certainly looks the part. Played acoustically, the M-15E has plenty of body, with a pleasantly warm midrange and similarly toasty high end. The tone is certainly compact - no pun intended - but more than robust enough to stand up to energetic chords without losing too much clarity. When using the onboard Fishman IsysT preamp and piezo pickup, the mahogany's warmth comes through, and you can enhance this depth by engaging the phase switch. The fingerboard's a little dry and, as mentioned, restringing does takes longer than usual due to the fiddly placement of the machinehead cylinders, but we feel there's a place for the M-15E in many a player's arsenal.